Thanks to everyone who entered our Country Ticket Giveaway to see Garth Brooks on April 23rd in Columbus! 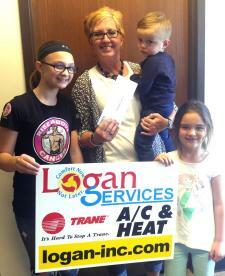 We had the big drawing last week, and the winner is.....LAURIE R. FROM GROVE CITY! Laurie was very excited to receive the phone call that she had been picked as our winner. She learned about our contest on Facebook, and has always been a big Garth Brooks fan - so she decided to enter! Laurie picked up her pair of tickets, with the help of her adorable grandchildren, and will be attending the concert this weekend! Congratulations Laurie! All of us at Logan Services wish you the best time at the concert! Want a chance to win in future contests? Like us on Facebook to stay informed!